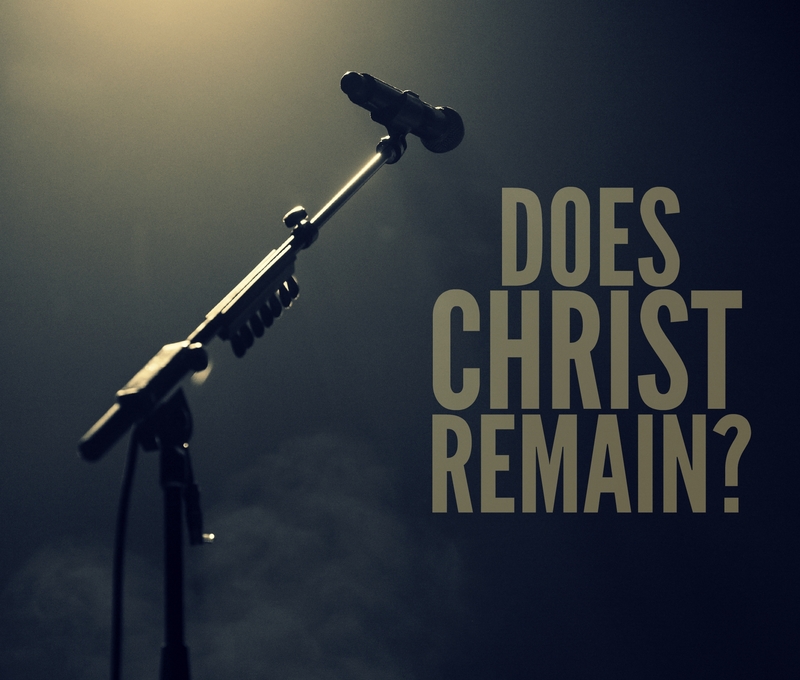 September 13 – Does Christ Remain? Relate: The conference drew the tens thousands it did every year. The names of the featured speakers were household names whose books lined many shelves and who led churches of thousands. The worship leaders and teams had albums everyone knew and had written songs that were sung in many churches every Sunday. However, the greatest figure at this conference came incognito as a guest using a pseudonym. Jesus Himself was a guest at this conference. The guitarist looked right into Jesus’ eyes and then he looked away. Quickly he glanced to both sides. There was not enough privacy and so he said under his breath, “I can’t really answer that question right here. Meet me outside in about ten minutes and then we can talk. React: My favorite worship song of all time was written and sung by an artist who, a decade later, declared herself a lesbian. Another major artist tweeted regarding a certain controversial topic, “I don’t particularly care about scripture’s stance on what is ‘wrong.’ ” I also remember reading an interview from another band. The lead singer said something along the lines of: “People keep wanting to pigeon hole us as a Christian band and I think that is unfair. We are a band that plays songs that appeal to a Christian market and some of us happen to be Christian.” It was a shocking statement for me to read in a Christian magazine endorsing and promoting a group I had assumed was a Christian band. The sad truth is, our music industry is just that: an industry. It is a profit making business appealing to a Christianized subculture that knows how to speak the right words, wear the right shirts, and sing the right songs but has as much depth and growth as a shallow puddle on a sunny day. Christianity just doesn’t seem to be very Christian anymore. And if you don’t believe me, just ask buzzfeed. Don’t let me ever lose sight of You. In my worship, in my words, in my study and in my thoughts, let me ever be about pursuing You. Be my first and only. For those times I have sought after my own gain, forgive me. For those times I have worked towards other purposes, forgive me. In everything I do, be the center. Let it always only be You. You really nailed that one, Beejai! I look at the Gospel Award shows and cringe, but then I do the same thing when I actually listen to the lyrics of some of the songs. The songs are not about Jesus (and His name is seldom mentioned); it’s about an implication of Jesus, but the songs could be about anyone. The artists are beginning to sound like some of the preachers–they have a sound, but no depth. Waking up this morning and reading many of these comments this morning was very disappointing. So many seem to have missed the point that I have very clearly failed to convey. My concern is not with the lyrics themselves but with the authenticy of the one singing. I would much rather someone sing, or even write, songs that are lyrically weak and theologically questionable with heartfelt devotion to God than to sing out even the most profound of truths with a wandering mind or a drifting heart. With all the attacks on Christians and our beliefs Christians have become afraid to confess Christ publically and that’s a travesty. Well, Beejai I will confess right here and out loud, Jesus Christ is my Lord and my Savior and nobody is going to silence me! Keep on spewing the truth. Good article. Well said, BJ. Love that prayer. It’s all about relationship, isn’t it? Love the story about Jesus. I can see that exchange. Very vivid. Be blessed. God is with you. Well said. I find most new songs are about Self, whereas the old hymns glorify Christ. Paul Wilbur sings Messianic worship songs that are wonderfully led by the Spirit. This short story posted by Beejai raises some questions about the authenticity of our faith. It’s well worth a read. Just because it’s not a Christian group who goes around preaching the word, doesn’t mean the lyrics aren’t authentic. I don’t believe a group has to be pure in order to find personal meaning or enlightenment. While I agree that profound truths can be gleaned from secular songs (I recently used a Pink song to end a devotional), I think your example from Madonna is a bit of a stretch. What I was writing about here, however, was less about the message being conveyed and more about the heart condition of the messenger. Pink has some very spiritual lyrics. But I still believe Like A Virgin is spiritual as well. Very true Beejai, unfortunately the same thing can also be said about very many ministers and priests of the Gospel, and others who make their living out of Christians and Christianity. But I take heart when I listen to songs being sung which truly glorify God, and sermons or talks being given which raise God on high by people through whom the Spirit of God is flowing, and who God is using to bring glory to His name. As God said to Elijah when he thought he was the only one left who served God. Rom_11:4 “But what saith the answer of God unto him? I have reserved to myself seven thousand men, who have not bowed the knee to the image of Baal.” And today God still has his Godly chosen people who are prepared to shine bright for him in this present darkness. Wow Beejai. Excellent post. I always struggle between commercialism and God’s place in it. But the focus is really the key. God is my focus and seeking (pursuing, as you stated) Him is utmost. Christianity for gain other than salvation and growth in Christ is vain. Love the prayer and it was prayed this morning with sincerity. Thank you for your boldness to tell it like it is. I love how in the end, your prayer directs us to look within than at the mess outside 🙂 This is sadly true though…. Hi BJ, there is a beauty in the witness of a believer that is totally sold on Jesus and who has learned and truly absorbed God’s wisdom and undeserved love, and it can be expressed via the written word as well as words in a song although at one point in time they were both the same. When songs are sung by a group or an individual, you never know for sure but like the psalms, the beauty of the author’s knowing can shine through. The hymn “Amazing Grace” comes to mind or “I Come to the Garden Alone” is another. You can’t articulate that knowledge and understanding or appreciation without having reached there. Some hymns or Christian songs have more depth in them than others, I can not presume what the author knows or believes, I can only know what it means to me and when it strikes a cord that reminds me of the grace that I have been given, I am grateful. I loved your post. Blessings. Recently I commented on another site with a similar conclusion as yours concerning Christianity not being very Christian. True Christianity is very Christian. Many have lost sight of the truth because true Christianity is not understood for lack of knowing what it is as found in God’s word. We are not perfect but God is continually perfecting the image of Christ in us as we press toward the goal. Our kaleidoscope of ‘Christian self-perceptions’ can never reveal the truth of who we really are or how deeply we are loved.